Take a second and look around. Brand imaging is everywhere, especially on social media. 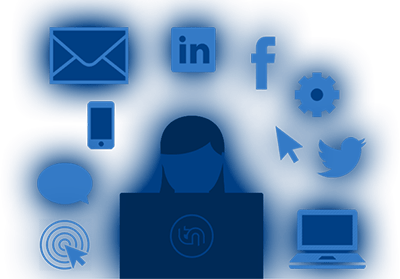 There’s no denying that social media engagement has become crucial to a digital marketing strategy, but managing your brand across multiple social media platforms is a lot of work, not to mention time consuming. Small businesses run up against the same roadblock time and again. The lack of the resources needed to maintain a strong social media presence. Add this to the misconception that social media is so huge that your marketing efforts can easily be lost among the traffic, and it is easy to see why some small business give up on social media before they even get started. But, did you know that only 25% of Twitter accounts are active? The reported numbers of businesses using social media only reflect one side of the story. The truth is there is plenty of room to expand and get noticed. So, how do you make it happen? You start by making the most of the resources you do have, and as a small business, your top resource can be summed up in two words. A recent study found that 88% of employees spend at least some time on social media while at work. They are already there, engaging with people, many of which probably fit into your target market. So, why not take the opportunity to turn this into a productive work activity and get your employees excited about promoting your brand in the process? You need to start by clearly communicating with your employees about how to post and interact on social media. We’re not talking about the logistics of logging in and posting a video. Instead, we’re talking about setting guidelines and rules about what type of content is appropriate and effective for building your brand. Set very clear guidelines about the type of content that can and can’t be shared. Consider each employees position in your business and the information they may have access to. A well-meaning employee might mistakenly share information that you want to remain private. Use this as a chance to cover all bases. Now is also the time to talk about the energy you want conveyed in these posts. You should remember that when encouraging employees to post from personal accounts, that you don’t always have the final say in what’s put out there, but you can go forth with a pretty clear set of expectations. Finally, use the training session to communicate the importance and value of your employee’s participation. Then take the time to brainstorm with them. What are their ideas for content? Should you set a calendar with post themes to keep in mind? What are their thoughts on this, and how comfortable do they feel promoting your brand within their own personal circles? While social media in general is more popular with the 45 and under crowd, you can take advantage of your team’s diversity in targeting different segments of your audience. Whichever social media platforms your employees are using is where you are most likely to find customers that are aligned with the same demographic. For example, would you like to target younger millennial women? Place this in the hands of your employees with an active Instagram presence where women aged 18-29 make up the majority of the user base. Looking to target educated professionals regardless of age or gender? Tap into the resources of your employees that actively engage on LinkedIn where the user base is pretty evenly spread out between men and women of all age groups up until 65. The one demographic that does make a difference on LinkedIn? Education. An estimated 50% of their user base is college educated with 77% having annual salaries of $50,000 and above. Expecting someone who is barely active on Facebook to participate in building your brand image on that platform is useless. Use your employee resources where they will have the most impact. There are multiple factors that go into play when a consumer makes a choice. Of those factors, the most important is trust. The overwhelming majority of consumers say that they will choose a brand based on personal recommendation over even the best ad campaign every time. You have the opportunity to let your employees spread the trust message to each person they engage with on social media. The thing is you don’t want their posts to seem unnatural and not aligned to the type of content they usually share. You want each post to blend in naturally with the rest of their content. One way of doing this is by letting your employees take the lead in developing a social media campaign. It could be a theme to the posts, an event that they want to promote or even something as simple as a brand specific hashtag to attach to their posts. Give your employees a little creative freedom, get them involved and get them excited about being your brand advocates. Let’s say each of your employees is only able to spread the value and trust message to ten people. This is a conservative number, but it is a starting point. Now, what happens when each of those ten people promote their own trust in your brand to ten more people, and so on. What started with just one employee has exponentially grown your followers. The next logical step is to turn each of those followers into customers. What you need is strategy to get them through your door, and nothing works better than a little incentive. Consider hosting a friends and family event across all your social media platforms. It can start with a simple post from each employee that offers a value incentive to share. Soon, with just one post by an employee, you have reached hundreds, or potentially more social media users, you will now feel connected to your brand as a member of this friend and family event. The number one tool for creating brand advocates out of employees? Being an employer that they are proud to promote. Sure, on occasion, someone might have something less than flattering to say. But how much of an impact does that have if you have fostered an environment where the majority of your employees speak only positively of your brand on social media? People want to be trusted and respected. Offer this to your employees, give them some creative freedom and watch them soar as your new brand advocates.